As part of the kickoff meeting for my MKTG 477 class, our good friends from Silverback Strategies generously donated a collection of very cool prizes. 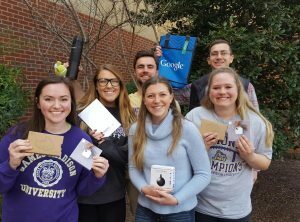 The prizes serve to motivate my MKTG 477 students to study hard and perform well on my AdWords test given during the second week of the the semester. We refer to this unique program as The Silverback Strategies AdWords Test Challenge. The top performing student gets first pick from the prize pool, the second highest student gets the second pick, and so on. On behalf of all of the students in my class, BIG thanks to Silverback Strategies for supporting the AdWords Test Challenge for three consecutive years. Allie Hammond is our grand prize winner for 2017 as she achieved the highest AdWords exam score in the class. Allie is a senior marketing major and a mathematics minor. 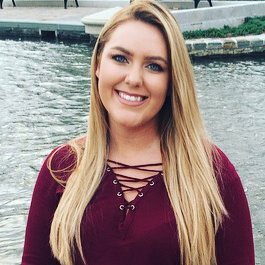 She worked as a marketing intern at National Spine & Pain Centers and currently is the Marketing Manager at JMU’s Center for Entrepreneurship. Allie was recognized by Marketing EDGE in 2016 as a member of the 3rd Place Bronze Winning Team in the Collegiate ECHO marketing competition. Congratulations to Allie on her strong performance! Michelle Mullins earned the second highest exam score. Michelle is a junior marketing major and a communications intern at JMU where she writes for the Daily Duke. Rachel Kirbabas, a senior marketing major with a minor in art, achieved the third highest score. Rachel worked as Merchandising Intern at Kitty Hawk Kites, Inc. In addition to the aforementioned students, I wish to recognize the first three students in my class to earn their AdWords Certification, a professional accreditation that Google offers to individuals who demonstrate proficiency in basic and advanced aspects of AdWords. Joey Scully was my first certified student this semester. Joey is a senior marketing major, a staff writer for JMU’s Breeze, and the Director of Film for the JMU University Program Board. Lauren Jones was second in the class to complete the certification. Lauren worked last summer as a digital marketing intern at R2Integrated. Brendan Reece, a senior marketing major, was the third student to earn the certification. Brendan works as an Operations Manager in the JMU Student Success Center.